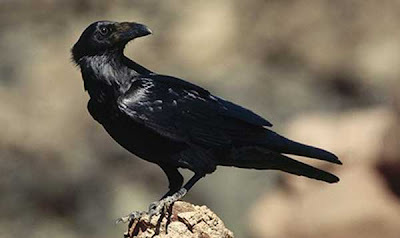 Police in Richmond, Maine, are dealing with reports of an amorous raven that has caused hundreds of dollars in damage to at least three cars. Police Chief Scott MacMaster said two people went to the police station last week to report their vehicles had been attacked by the raven, which caused damaged rubber gaskets around windscreen and windows and the windscreen wipers on at least three cars. MacMaster said the first raven attack, in which a pickup truck was damaged was reported on May 21. The owner said he had watched the raven land and see its reflection in the truck window. The bird caused approximately $500 in damage, according to the owner. “The raven does its territorial strut as he described it and it starts attacking the reflection in the window and pulling off the rubber around the windows and his windshield wipers,” MacMaster said. “The raven in the reflection would not back down, so he attacked himself.” The next day a resident reported that “a buzzard” had ripped the windscreen wipers off his car. MacMaster said the buzzard was, in fact, a raven. “He had to bring his own car in to be fixed, and while he was having the repairs done and it started attacking the rental car,” MacMaster said. The second victim said he took an unpaid day off from work so he could conduct a stakeout to try to catch the bird in the act. When that failed he went to the police station. “He wanted us to shoot the raven,” MacMaster said.